A Girl Called Erika: Carrot Cake! This Easter, Boyfriend's mom put me in charge of making desserts. I was, as you might expect, excited about this. That did mean, though, that I actually had to decide. It's so easy to just think about things I want to make and then never actually get to them. Haha. After several days of pondering, I decided that I wanted to make a carrot cake. Yes, indeed. I had never made a carrot cake before, so I went trolling around the internet to find a recipe that was simple and something I felt confident about baking successfully. I found a couple of recipes that were contenders, and ended up choosing a recipe from Betty Crocker. Good old Betty. I would highly recommend this recipe. For real. You should know that I did not attempt making my own frosting. I've never ventured down that path and I decided that an important dessert for a family holiday was not the time to try. Haha. The store-bought cream cheese frosting I did use turned out beautifully. AND!!! I successfully pulled off a layer cake! I am never good at keeping those kinds of cakes in one piece. I don't know why. Just ask my dad. His birthday cakes have a history of... collapsing. 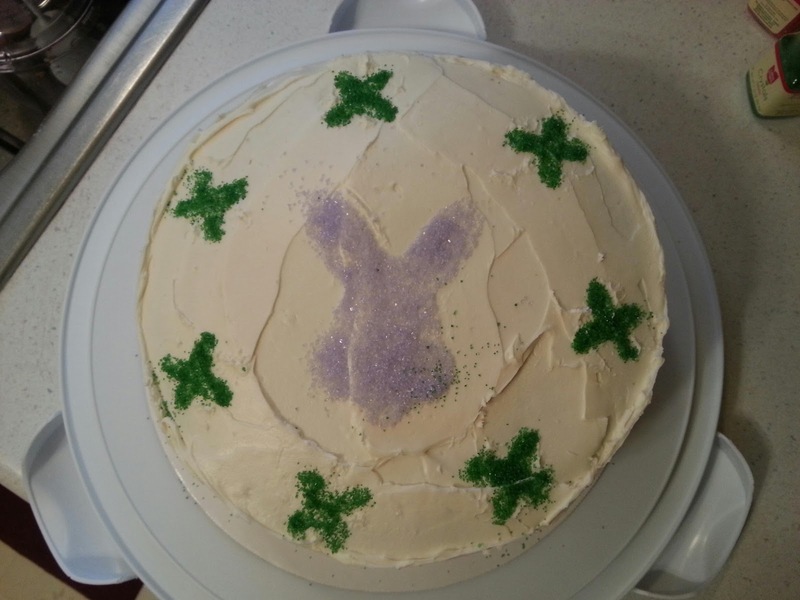 Decorations-wise, I used a bunny-shaped cookie cutter and sprinkled those fine, sparkly little purple doodads to get the bunny shape. For the little butterflies, Boyfriend made me a little stencil with wax paper. It turned out perfectly. This cake was, without question, a hit. I was told by more than one person that it was the best carrot cake they had ever had. In fact, Jason has requested that I make him another when I have the time, and Boyfriend's mom has already told me that she would like one for her birthday. I'm so happy that it turned out so well, and that so many people liked it. The Duck wasn't too sure about it, though. She had her hands in her piece of cake right away and seemed to really be enjoying it... until she got into the cake. Turns out, she was only interested in the frosting. Haha. She started inspecting the cake eventually and, finding a walnut, said, "What's in this?! NUTS?!" Classic. I really need to make another carrot cake soon.